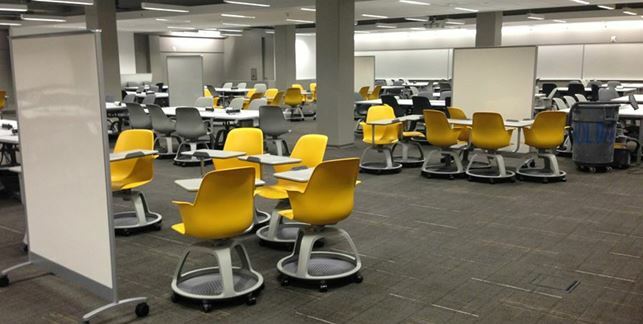 Library Renovations: Pedagogy as driver? I spotted an interesting blog post about what drives the physical shape of academic library renovations. Here at ASU, Hayden Library has completed the first phase of a major library renovation. The sub-basement of Hayden has been partially emptied of its stacks and refitted with futuristic computer classrooms and group study spaces. Academic libraries are thus being repositioned as active “learning spaces” rather than static repositories of information. This trend is several years in the making, and I imagine that only our children will be able to report on the full effects of transformation. Change is always hard, but when it comes to physically re-imagining what many consider sacred ground, emotions can run high. Classes just started last Thursday at ASU, so not much word yet on how the lower level classrooms are working out. How about your library? How has your library been transformed? Any plans for renovation?